Last spring, Scott MacIntyre lived his dream while competing on American Idol and ultimately placing 8th. At the same time, his little sister, Katelyn, now a freshman at Biola, was struggling with health issues and in line for a kidney transplant. For the MacIntyre family of Scottsdale, Ariz., it was the best and worst of times. Though the family has faced many recent hardships (Scott also had a kidney transplant and both Scott and Katelyn have visual impairments), they’ve come back strong in 2009, a year of extremes that included appearing on the world’s biggest TV show, traveling across the country as part of an arena tour, and moving Katelyn in to Horton Hall at Biola just months after she received a new kidney. 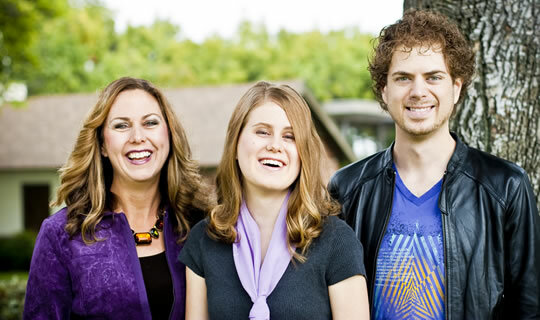 Biola Magazine recently sat down with Scott and Katelyn, along with their mother Carole (’82), to talk about their crazy year of American Idol, health challenges, and how the whole experience grew their faith. The three of you got your start, along with [brother] Todd, singing as “The MacIntyre Family Singers.” What was that experience like? Scott: The first time the four of us sang together was 1998 in Toronto, Canada. As time went on we split into four parts because Katelyn and mom would share the soprano part but then Katelyn could carry it on her own. Our mom did alto and Todd and I would switch off doing tenor and bass because we both have wide ranges. We did a lot of a capella jazz music, gospel, some Broadway, some classical Vivaldi type stuff. We did a tour last year, the year before American Idol, through California, Arizona, Toronto, Virginia, Illinois and Washington D.C. We actually ended up at the Kennedy Center for a ticketed concert there. It was a concert tour I planned and organized myself. It was a good experience, giving me a great handle on the business side of music. We had fun doing it as a family but now it’s on hold. American Idol happened, and now Todd is in Japan for six months working for Tokyo Disney as a lead singer/dancer/actor for many of their shows. So the three kids — Scott, Todd and Katelyn — all auditioned for American Idol right? Katelyn: Yes, all three of us auditioned and all of us made it through several of the producer rounds before the actual taping before Randy and Simon and Kara. The producers said they could only take one of us, and they picked Scott. Were you bummed at all that only Scott made it to the judges’ round? Katelyn: We were all so excited to have made it through a few rounds together, and then when Scott was the only one to make it on the show we were bummed a little but only for like a day. Then we were just so excited that we could support him. Scott: Because we’ve done so much music as a family, we have this mindset that if any of us succeed we will just bring the others along. So it’s definitely a family thing. ### So Katelyn, what was it like to have your brother suddenly thrust into the world’s spotlight? Katelyn: It’s still hard to believe sometimes, still hard to grasp. But he’s still the same person he was. I’m really just so excited that he now has this platform to reach for everything he’s been wanting for so long, to be able to get his music out there on the national stage. Now he can; now he is. So it’s just exciting for me to cheer him on. I can’t wait to see what happens next. Scott: It is very surreal. We’re on the show and it literally airs in places you would never dream — India, the Philippines, Japan. I had some fans from the Philippines walk up to me in the supermarket the other day here in L.A. and they said how much they loved me. It’s amazing. I get recognized pretty much everywhere I go. Carole: We were at Disneyland about three weeks after Scott was off the show, and it was just crazy. Scott was causing a literal roadblock in Fantasyland. Scott, has the fame given you a platform to be up-front about your faith? Scott: On a show like Idol, where millions of people are waiting to see what you’re going to sing and what the lyrics are to your song, you have to be very mindful of song choice. You’re very influential all of a sudden, and the last thing I’m going to do is get up there and lie. I tried to pick songs that aligned with my beliefs. Because of what I’ve come through, it’s my whole purpose for being on American Idol. Carole: When we started singing as a family, our goal was to have it be a ministry — playing at churches, retirement homes, whoever asked us. Immediately following our performances, people come up to us and ask us if we are Christians, even if it isn’t obvious in the performance. We want it to be obvious in the way we carry ourselves. Scott: A pastor from Hope Chapel in Hermosa Beach came up to me recently and asked if I was a believer, and said that he could tell I was. He phrased it as a statement and not a question, which is the best thing you can hope for. So, tell me a little bit about what American Idol is like behind the scenes. How “real” is what we see on TV? Scott: Yeah, the producers were very involved and they would change your song if they didn’t like it. The whole reality part of the show, which is half the show before it goes live, is all producer driven — and then after that point it is producer driven from behind the scenes. They edit whatever they want. They promote certain people in certain ways. So much of it has to do with who their favorites are. You do what you can do. You be yourself and the reality show goes on. I’m very happy whenever someone comes up to me and tells me that they saw something different in me. Carole, you were there with Scott in L.A. the whole time Idol was going on, right? Carole: Yes, I lived in the mansion in Bel Air where the Idols all stayed. There were like 50 rooms and it was someone’s home that had been rented out. I was with Scott during the rehearsals and worked with him on things like choreography. It wasn’t just for the dancing but also the camera choreography. There are 90 different cameras going in the studio and 12 major cameras that Scott had to “follow” with his vision while singing a choreographed song. It was a challenge for Scott because of his eyesight, but I helped him as much as I could. I had a unique perspective being there for the whole time. There have been parents of minors before who have lived with and gone on tour with their kids, like David Archuleta, but Todd and I had unprecedented access because we were there in a sight/guide capacity. We were literally in every single meeting, every single rehearsal, all the commercial shoots, everything. Katelyn, how much of the Idol experience did you get to experience? Katelyn: My dad and I drove out almost every week for the live performance shows. It was amazing to be there, with the energy of the audience, and to see a little bit of behind-the-scenes. I also got to visit the mansion and eat dinner there a few times. This summer I was able to go to three shows on the Idol tour: Los Angeles, San Diego and Phoenix. It was really exciting to go. I haven’t been to too many concerts, but it was pretty cool to be at one where my brother was singing to such a huge audience. Scott: The concert tour was really different from the TV show too. When you compare what I did on the TV show with the tour this summer, it’s the first time I kind of solidified my musical image. I got to pick everything I did. I didn’t do anything I did on the show. We didn’t have “Country week” or “Motown week.” You really saw 10 people clearly defining their own unique genres and styles. It was a great show. I would have paid for it over and over again. This year has been an exciting one for your family with Idol, but there were also health challenges with Katelyn happening at the same time. What was it like to have such a year of extremes? Carole: When we got the news in December that Scott made the top 50, we also found out that Katelyn had kidney failure. We found out on Christmas day. It was a very difficult time. On top of Scott’s peaks of excitement with Idol, our family was also going through tremendous valleys with Katelyn’s health. And on top of that, my dad is terminally ill and is in hospice here in Southern California. Todd moved to Japan recently, and a close uncle of mine passed away. Normally it’s enough to just have one of these events going on, but we had all of them happen for us last year. It’s hard to walk through that, but you just keep going, trusting that God has a plan and a purpose for the timing. Scott: It’s been like that a lot in our lives — where the mountains and valleys kind of occur at the same time. Just two years ago I went through my own ordeal with kidney failure and had to come back from London where I was studying. I was going to continue at Cambridge but I had to come back to the states and have emergency dialysis for 10 months before a donor was found. During this time I couldn’t play or sing. It was a rough, dark time. By the time that year had ended, and by the time I had my transplant, I decided to just focus on music and not go back to school. And then American Idol auditioned in Arizona for the first time, while I was recovering from transplant surgery. I never would have been able to audition or be on the show while I was on dialysis, so the timing was perfect. I just had my two-year anniversary of the transplant while I was on tour. It was surreal to be standing by a piano in front of 15,000 people, telling them about how I was in such a different place two years ago. I tried to pinch myself as much as possible. Carole: Scott’s kidney donor was a Christian who is a friend of ours and also the wife of Scott’s Arizona State piano professor for four years. Katelyn’s donor was a family friend as well, up until about 24 hours before the surgery when we got a call from the doctors saying there was a pediatric donor that had become available. We had a half hour to decide if we wanted to go with the deceased pediatric donor or the live donor that had been approved. All this was happening in April, right after Scott had been voted off American Idol, and Scott and I had just flown in from New York that day. It was the first time in six months that we were all in the same state. Has it gotten any easier for all of you to be together in the same place now that the show is over? Carole: Not really. Katelyn’s living at Biola now. Scott — we’re not quite sure where he’s going to live. And Todd’s living in Japan. Scott: I don’t feel like I’ve been home for more than a couple days here or there since February. It’s quite a long haul. You fall into a different state of mind. When you think about how this process has really been going on since July 2008 and right now they’re well into the process of selecting the contestants for next year, it’s really amazing. At the start of July you realize you have to focus on American Idol and nothing else because you are bound to secrecy and exclusivity. Your life is literally on hold — in terms of music, performing, recording — from July on. Come February, if you’re still around on the live show where people are voting on you, you’re literally in a whirlwind getting sometimes no sleep or three hours of sleep. It takes its toll on your mental state and your emotions. Then you leave the show, come back for the finale in May, then rehearse for the live tour if you made the top 10, and then you tour until Sept. 15. We had many weeks when we had like 10 shows in 12 days. After the tour I went immediately to New York City, where I met with a book agent about possibly writing a book. Then we were in Arizona for a day, then Hawaii, then Arizona again for a day and now here! Katelyn, do you have aspirations of auditioning for American Idol again? Katelyn: I’ve been asked that, but I think I want to finish my degree first. And also — even though I wasn’t IN American Idol, I feel like I’ve had enough American Idol for a few years. I’m a bit American Idol’d out. But you never know. In a few years if they’re still doing the show, who knows. I will certainly know what to expect. I’m definitely keeping an open mind. What other aspirations or plans do you have? Katelyn: Well, my degree is classical voice, so I love listening to opera and classical things. So something of that nature would be really exciting. But I also do love country. Who knows? I don’t really know yet, but I just love music and I’m excited to keep pursuing it. Do you think you’ll have opportunities, just being the sister of Scott? Katelyn: Hopefully! Yeah. I get recognized as his sister occasionally. Usually when we’re with him people recognize us as his family. Carole: People have met us on the show as a family, and Scott was a figure that people could identify with for having gone through so many challenges. So most people who meet him just want to hug him. Which is totally different from meeting Bruce Springsteen or something. You’d never go up and just hug him. It’s sweet. Katelyn, how did you end up at Biola? Was Biola always where you were going to go? Katelyn: No, actually it wasn’t. I obviously knew about it because my mom went here, but I applied to a number of schools and got accepted to three — UCSB, ASU and Biola. I didn’t really want to stay in Arizona; I wanted to branch out a little, and Biola just became really appealing to me because of its Christian point of view. When I came to do my vocal audition I loved the size of the campus, and everyone was so friendly. It was such an easy campus to navigate, and it was relatively close to home. I was sending in my applications and still deciding when I had my surgery back in April. And the deadline was June 1. Up until the last week I still hadn’t decided, but in the end I just leaned toward Biola. Carole: We weren’t even sure she could attend university in the fall because of her surgery. So that was another huge answer to prayer. It’s been a huge blessing on her life to be here. Are you liking Biola so far? Katelyn: It’s been really good. I’m loving it so far. I’m meeting some really great people, love the community, the dorm (Horton). And I love the Café, of course. I’m enjoying all my classes and it’s wonderful to have the godly Christian view in every class, and to have the Bible classes providing that foundation. I’m majoring in vocal performance and it’s a great music program — all the amazing concerts and professors. It’s been really good so far. How is the recovery going from the surgery? Katelyn: There are still a couple complications, though not really with the surgery as much as just with having a lowered immune system. The surgery was great. The kidney is doing really, really well. But I’ve been feeling good. I’m relatively healthy. It’s amazing what I’ve been able to do here. As you’ve gotten to know people here, has the American Idol thing come up much? You being the sister of Scott MacIntyre? Katelyn: Some people have been hesitant to ask me. Some have been like, “Tell me all about it!” But I have a lot of fun. I really don’t mind. I have a montage poster of myself with all the Idols and I have that up in my room, so it’s kind of fun to show people that. For each of you, what would you say have been the best and worst parts of this last year? Katelyn: Probably the worst was just finding out about the kidney failure. Being taken to the hospital, then finding out on Christmas morning that my kidneys weren’t functioning. That day and week were crazy. We’d seen Scott go through it, and now it was happening to me. It was frustrating. As for the best, I actually called into the Sean Hannity radio show — not once but twice this year. The first time I just called to tell him how much I enjoyed his show. I sang on the show, live on the air. Then the second time I called it was after American Idol. That was a highlight. Another highlight was getting to go to the Idol shows and the finale, and I really enjoyed the after parties. I loved meeting Paula and some of the past American Idols. Carole: The high was definitely just Scott going through the Idol experience and being able to go through it with him. Waking up every single day never knowing what the day was going to hold — everything from doing a TV show live to then getting on a private jet and flying overnight somewhere. And you don’t know where. They don’t tell you and they don’t give you a schedule because they want to keep it confidential. And then another day I’m in New York, and I wake up, put on makeup and find myself doing the Today show with Scott. It was exciting stuff. But the low point would have to be all the stuff we were dealing with with Katelyn, especially around Christmastime and after. It was surreal to have such high highs and low lows. But it’s all taken in stride. I know God’s timing is perfect. I almost think that the timing of Scott’s American Idol experience was something God allowed as a happy distraction for us while we were dealing with the difficulties with Katelyn. Katelyn: It definitely was. I’d be home in Arizona getting blood tests and tests for the surgery, then I’d come out to L.A. and it’d be so fun to get dressed up and go to be in the audience and cheer for Scott. Scott: The best part for me was the tour. So much better than the TV show. Getting to meet all the people who have supported you the entire time, putting a tangible element to what the whole point of the show is. It was amazing to have the people you were performing to under the same roof as you instead of through the television cameras. It was amazing. I think the worst part was just everything that goes along with it — whether family or friends or just being away from Katelyn’s whole situation. I really feel like now coming off the tour I’ve been in a time warp. All of a student it’s like a year and a half of your life is gone and you know where it went, and it’s definitely time well spent, but meanwhile everyone’s lives have gone on while you’ve sort of been at a standstill. Everyone else has been living their life, but I haven’t been a part of it. What are your future plans, Scott? Scott: I am working on my next album. I did six independent albums before Idol and now I’m working on the next one. I’ve been in meetings with labels in New York and L.A. The album is going to be largely self-produced, if not completely, in my project studio in Arizona. I will bring in other musicians, but on some of the songs I will probably play all of the instruments, because I do play drums, guitar, piano, and the other accoutrements. But sometimes I’ll bring in a cello player or something. I have an EP out on iTunes now called View From Above, which is a good sample of what the album will be like. I tend to straddle that genre between the more sparsely produced singer/songwriter genre and the power pop adult contemporary type of thing. I also met with a book agent in New York because I’ve gotten offers from pretty big publishers. So I’m definitely looking forward to sharing my story to a fuller extent. The viewers of the TV show only got to know half my story at best, and it was very surface at that. I broke the story about my kidney transplant on Regis and Kelly after I left Idol, which was a good time because the competition was over and I think it’s another part of my story that can make an impact on peoples’ lives. I’ve received thousands of e-mails from around the world who have said that the little bit of my story that they saw on American Idol has meant so much to them in their own life. And I think if people knew the whole story or just more of it, it would be even more worthwhile. I’m in a lot of meetings. It’s like fitting together a puzzle. I’ve been on this huge tour that a lot of people never get to do. And I’m so grateful for that. I never thought that my first major tour would be a stadium tour. You have to work for years to get to that point. And I have put in years of work, but it’s all sort of come to a point with American Idol. I’m so grateful to the fans for supporting me. It really touches my heart that people are excited about this passion. Check out Scott’s music at www.scottmacintyre.com or myspace.com/scottmacintyre.